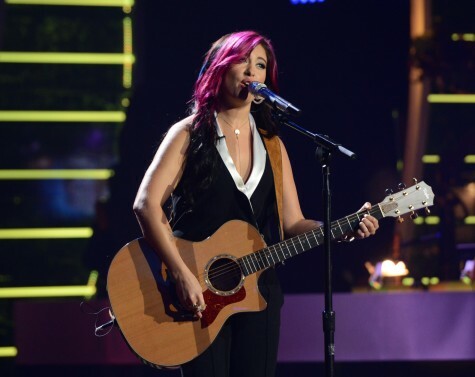 Jessica Meuse, 23, stood out on this season of American Idol — and not just because of her trademark pink hair. The singer from Slapout, Alabama, personified cool-rocker-chick, and her honest and easygoing attitude made her a favorite to both fans and judges. Many competitors get pigeonholed into a single genre, but she admits to being influenced by every genre of music. Her singing style is a mix of gritty rock with metal and country notes. The contestant’s vocals were praised each week, but the judges repeatedly criticized her on her lack of stage presence and connection with the audience. Keith Urban even said she didn’t have enough “release.” Fans complained that she was picked on more than the other singers, but she chalks it up to part of the experience. “At times, I felt picked on, but it’s part of the game. I know I have bigger things ahead of me, and I’m going to make them happen,” she shares. This isn’t the last you’ll see of Jess! You can catch her on the American Idol summer tour. Until then, keep up with her on Twitter @JessMeuse.